Do The Age Of Ultron Funko Pops Reveal A New Take On The Hulk? 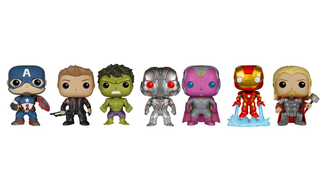 As inevitable as the sun rises and sets, there is more Age of Ultron merchandise heading into the wild - and equally inevitably, there are going to be Funko Pop! Vinyl figures based on the team. But interestingly, one of them might reveal something interesting about the movie. Update: Now with high res pictures! These figures will apparently start hitting next month, too, so huzzah. Not a Black Widow in sight though, boo. It's definitely part of the AoU line, as it shares the sculpt of the normal hulk - but it's interesting to see the Hulk in grey. Comic Book fans know that the original Hulk was grey before his creators decided to switch him to Green, making the grey colour part of the character's story as a sort of alternate-Hulk aspect. The red glow around his eyes is also interesting - the most recent trailer showed the Hulk (not grey at the time) with something similar while fighting Iron Man. Is this 'savage' Hulk this version? I wonder if the red implies the manipulation of Scarlet Witch rather than the Hulk going a bit crazy like he did in The Avengers. Time will tell if the colouration means anything though. A grey Hulk on the big screen could be pretty neat.